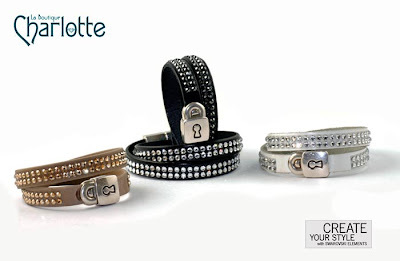 La Boutique Charlotte Blog: CrystalTex Swarovski Elements on leather. CrystalTex Swarovski Elements on leather. An example of some easy to make bracelets with CrystalTex Swarovski Elements. Just cut your exact length of leather and CrystalTex. Fix the Crystaltex by ironning on max. temp. Glue both ends in your favorite clasp and be irresistable.